Satisfactory academic progress refers to a federal regulation requiring student to make progress toward the completion of a degree or certificate program in order to maintain eligibility for financial aid. Each semester, Rio Salado College evaluates whether the Standards of Academic Progress (SAP) set forth by the Maricopa County Community College District have been met. The evaluation process determines financial aid eligibility based on three measures: Grade Point Average (GPA), Progress, and Maximum Time Frame. GPA – Students must meet a minimum grade point average based on the total number of credits attempted. Progress – Students must successfully complete 2/3 of all courses attempted. Progress is calculated cumulatively and carries over from one term to the next. Maximum Time Frame – Students who have already attempted more than 150% of the required credits for a program will no longer be able to pay for the program using federal financial aid. More information on the maximum time frame requirement is available in the Financial Aid Tips: Maximum Time Frame post. Attempted Credits -- If a student withdraws from class outside of the approved drop/add period, the credits are still considered attempted credits and will be considered in the SAP evaluation. Students who do not meet all three criteria for satisfactory academic progress are no longer eligible to receive financial aid and in some cases, may be required to return a portion of the aid they've already received. Students who have lost their financial aid eligibility due to unsatisfactory academic progress or to the time frame requirement have the opportunity to appeal by completing the Appeal for Satisfactory Academic Progress and/or Appeal for Maximum Timeframe forms. The full Maricopa County Community Colleges Standards of Satisfactory Academic Progress for Financial Aid Eligibility are available on the Rio Salado College Financial Aid website. Those who are planning to deep fry their turkey this Thanksgiving may recycle their used cooking oil at the Cafe at Rio. A 50 gallon drum will be located on the back dock of the Tower at Rio building and will be clearly marked as a receptacle for used cooking oil. The oil will be recycled through a partnership with the Green Dining Network for use as bio-diesel fuel and other environmentally friendly products. A much larger receptacle will also be available at Green Dining﻿ Network's location at 3654 S. 16th street in Phoenix. There will be a padlock on the receptacle, but users can simply lift the lid and pour the oil through the grates. Contact Sustainable Food Systems Director Michael Hodgins at the Cafe at Rio for details. 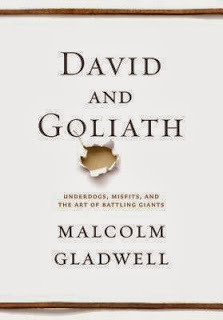 Library New Titles - Malcolm Gladwell's David and Goliath Is Here! 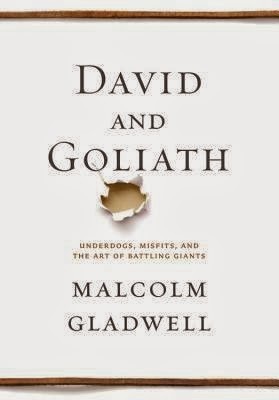 For a complete list of all new titles visit the Library Website. Do You Believe in Magic? : The Sense and Nonsense of Alternative Medicine by Paul A. Offit, M.D. Rio Salado College has opened a new location in Tempe to better serve students and residents in the East Valley. The location, RSC Southern, located at Southern Avenue and the 101, officially opened its doors at this week during a ribbon cutting ceremony on Wednesday, Nov. 13. “What was once an empty shopping plaza now stands as a beacon to residents to improve their lives through the power of education,” said Dr. Jo Jorgenson, Rio Salado College’s dean of instruction and community development. Open since June, RSC Southern has served more than 400 students through its College Bridge Pathways programs that include adult basic education, GED prep and English Language Acquisition for Adults classes. The location also offers a testing center, academic advising, counseling, tutoring and other college support services, and is the future home of the East Valley Veterans Education Center. "The new RSC Southern location provides expanded access to student services for our online students as well as educational opportunities for College Bridge Pathways students,” said Dr. Chris Bustamante, president of Rio Salado College. One of those College Bridge Pathway students is Tempe resident Vincent Smalley, a student who recently earned his GED after taking prep classes at RSC Southern. Smalley credits Rio with more than just giving him an education. RSC Southern also benefits the East Valley by partnering with local community organizations. MCCCD Chancellor Rufus Glasper echoed the importance of community involvement. Rio Salado College is the largest online public community college in the nation serving more than 65,000 students annually with more than 40,000 students on line. The college enrolls more than 2,300 Tempe residents annually. This story can also be read in the November 15 edition of The Tempe Republic. Each year, the Maricopa County Community College District Center for Learning and Instruction sponsors a district-wide competition to encourage and recognize its student writers.The annual competition showcases originality in Poetry, Fiction, Essay, and One-Act Script writing. Winning contributions in each category are then published in the MCCCD annual publication, Passages. Students may submit their original works using the Call for Entry website. For complete instructions visit the Maricopa Center for Learning and Instruction's Creative Writing Competition webpage. Entries for the 2013-14 competition must be submitted to the Call for Entry website by November 22, 2013. President Barack Obama challenged America’s colleges and universities to increase the number of students completing degrees and other credentials that they can put to work. In response to the president’s completion agenda the Maricopa County Community College District and Rio Salado College have taken steps to better prepare students from the outset of their college careers. The Student Success Initiative, or SSI, includes five success strategies designed to positively impact student retention, persistence and degree completion. Launched fall 2013, these steps are now required of all students who are new to college and seeking a degree or planning to transfer to a university. Placement testing to determine the student's preparedness level for English, Mathematics and Critical Reading classes. These tests can be taken free of charge at any Rio Salado testing center and must be completed before registering for classes. Preparatory classes as a pre-requisite when indicated by placement testing results. Students who do not test into 100-level courses are required to take preparatory classes before registering for 100-level courses. College success courses are strongly encouraged for students who test into English, Math or Reading classes below the 100 level. These classes focus on orientation to college, personal growth, and study skills development as well as educational and career planning. Academic advisement is strongly encouraged. Students who meet with an advisor will discuss their academic and career goals and plan their course load. New Student Orientation (NSO101) Rio Salado's FREE, non-credit online orientation class introduces students to the RioLearn online learning environment and provides information about college programs and policies. It also offers guidance on financial planning and college success. “The purpose of the Student Success Initiative is to help every Rio Salado student be successful in their classes, but also to help them with the larger goal of completing their education,” says David Hall, Director of Academic Advisement at Rio Salado College. To learn more about these success activities, and how to pursue them, visit www.startatrio.com. This portal for new students offers a step-by-step guide to the process of enrolling, choosing a program, testing, payment and more. College cafeterias are not typically a first choice for a healthy, organic lunch. Luckily, there is nothing typical about Tempe-based Rio Salado College. With seasonal menus, locally-sourced ingredients and produce fresh from the college’s backyard garden, the Café at Rio has become a local lunchtime hotspot. The secret to the Café’s success is its garden to table philosophy and the high quality organic produce that is grown less than a touchdown pass away from the kitchen. Vegetables and herbs planted in the Garden at Rio include rosemary, basil, mint, sage, zucchini, eggplant, okra, broccoli, chiles and cantaloupe. 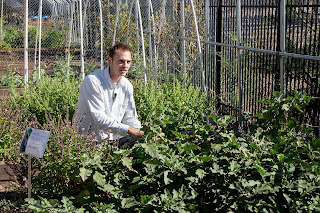 Rio Salado Gardening instructor Josh Sundberg uses the garden as a learning lab where students discover gardening practices like aquaponics, companion planting and trap crops. One of the first things Sundberg teaches is a respect for bees. According to Sundberg, the Garden at Rio uses no fertilizer and doesn't require tilling. “I really want people to reconnect with nature. Forests don’t need to be tilled or fertilized in order for plants to grow.” Sundberg said. Sundberg said he uses natural methods to control unwanted pests. “We use mint in the Café for our flavored waters. In the garden, mint is planted next to jalapenos to keep insects occupied. I’d rather have them eating mint than my cash crops.” Sundberg said. As for weed control, Sundberg said he doesn't believe in it. 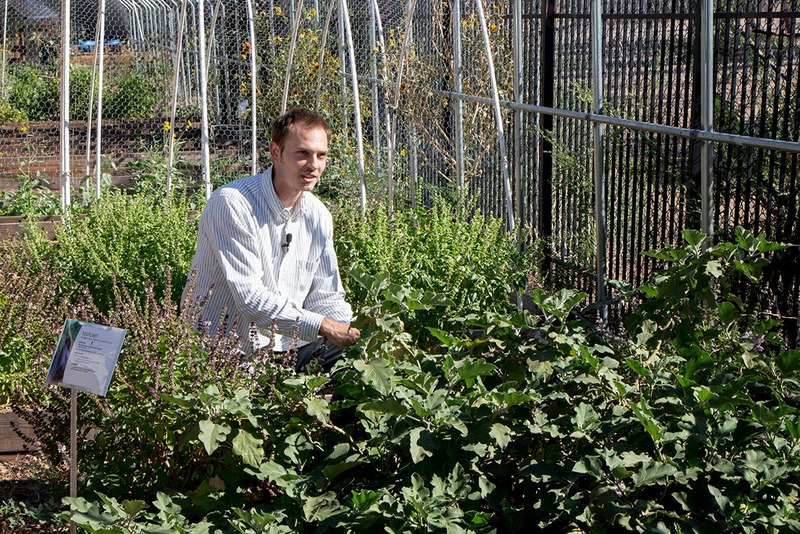 According to Rio Salado’s Chef Ben Leach, the focus on sustainability and local agriculture is about more than just environmental concerns. This story can also be found in the Nov. 2 edition of the Tempe Republic.